The Italian vacation to which I alluded in January is come and gone. And it was wonderful. I ate so much great gelato, pizza and pasta that I will have to do a separate posting on the food. Since N and I spent 9 days in Rome for our honeymoon in 2012, we’d already done a lot of the must-do things in that city, and we were free to plan each day — or not — as it came. This time, after a few days, we were ready to get out of the city. We opted to head to the beach. 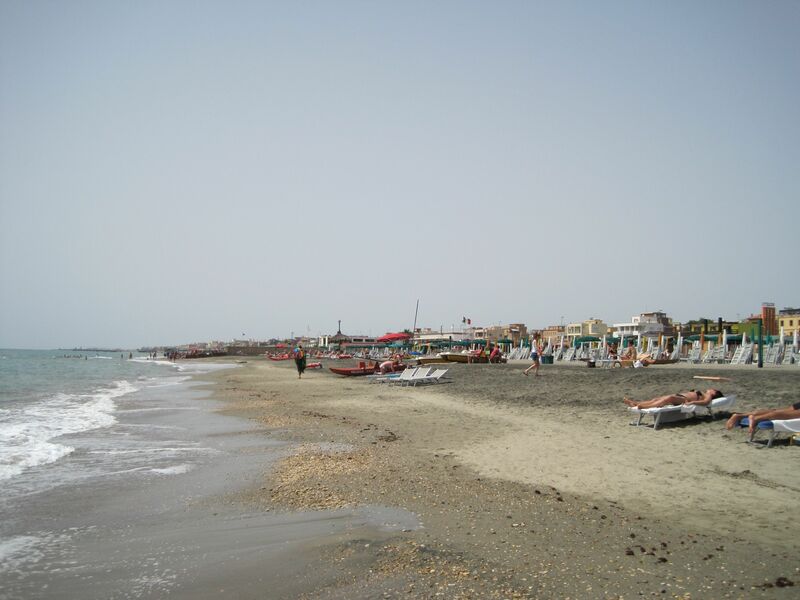 From Rome, you can take the Metro straight to the beach at Ostia Lido. It’s only about half an hour from the city, and you can transfer to the train to the beach on the same 1.50 Euro ticket that got you started on your journey. It’s a bargain and a great getaway from Rome that doesn’t even have to take your whole day (which is good because we got a late start after a lazy morning and a trip to our neighborhood outdoor market for our picnic lunch). Since the journey was ridiculously affordable and we were warned that the public beaches might be crowded, we planned to pay to enter one of the private beaches, and we went armed with the name of a recommended beach. All the beaches have their own bars (a bar is a coffee shop that also serves beer and wine, some cold food like pastries and panini, and maybe even hot food) and usually bathrooms and chair rentals, but private beaches offer more space and well, privacy. They have fancier bars or maybe even nice restaurants serving fresh seafood, and if you want to shell out, you can rent a private cabin for changing. It seemed like it would be a fun cultural experience. But we got sidetracked by a cultural experience of a different kind. On the train, we were befriended by an old Italian man. Actually, he engaged us in friendly conversation with several people on the train, and they all discussed the beach we had chosen and what bus would get us there once we got off the train. 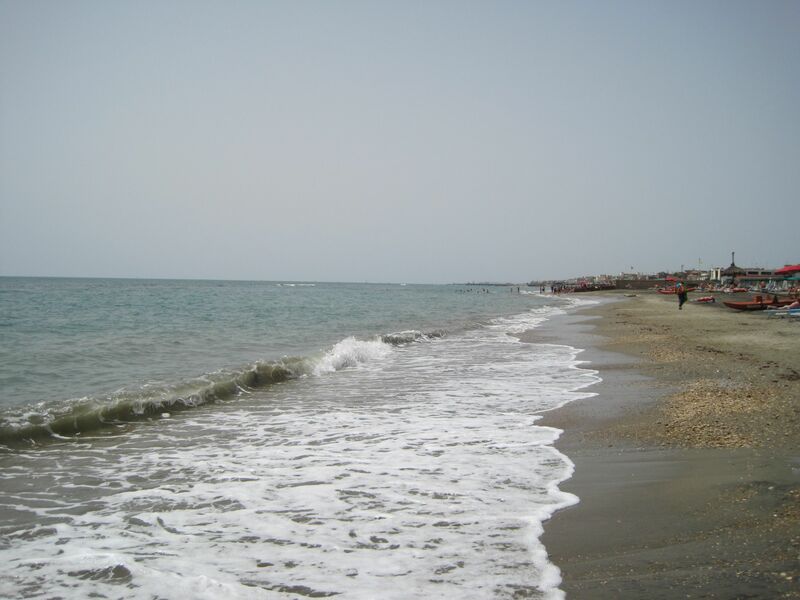 Then our friend offered to take us to his favorite beach. With our limited Italian we gathered that it was the public beach where he, retired and with a free senior citizen pass for the Metro, goes every single day. We made sure there were bathrooms, umbrella rentals, and of course, a bar, and then decided we’d follow him. 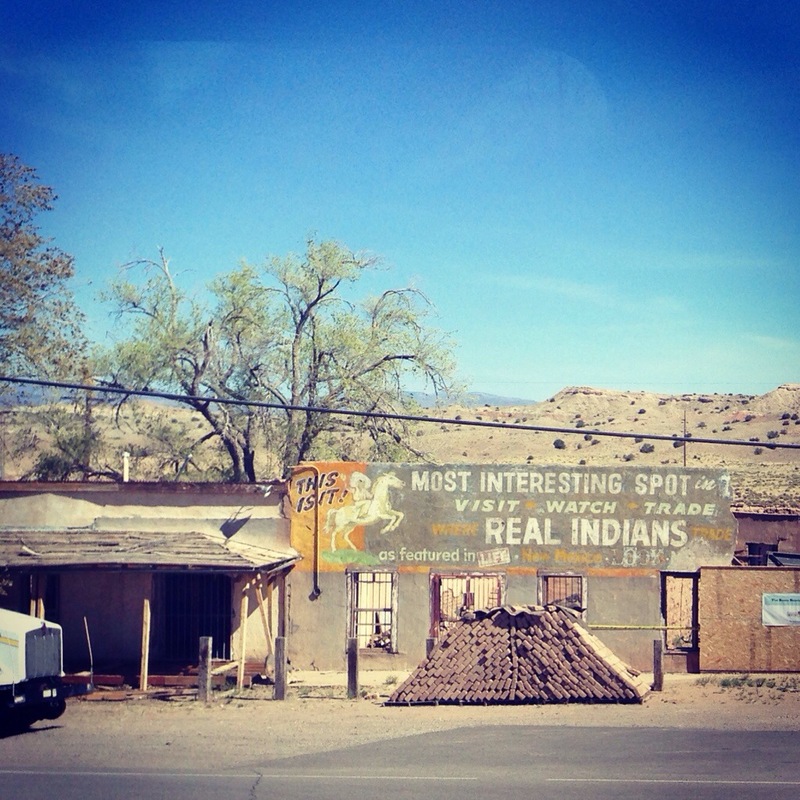 Why pass up the opportunity to experience something alongside a local? Also, his beach was a short walk from the Metro, two stops closer to the city, so we’d be on the sand faster and with a guide to get there we didn’t have to worry about taking the wrong bus and ending up somewhere way down the coast. When we got off the train, the old man showed us the fountain where he always fills his water bottle (Rome has these ubiquitous and wonderful drinking fountains that continuously dispense safe, delicious drinking water), and then treated us to coffees at a bar on the way down the street! He delivered us to the beach, negotiated with the attendant for us to pay 5 Euros instead of 6 (too much, he said) for an umbrella, then shook our hands and went to his favorite spot to bake in the sun. Sure, the beach was crowded. It was full of young Italians — not under umbrellas — and young central and eastern Europeans as white as us, who were more likely to be protecting themselves from the sun. We lounged under our umbrella for hours, taking breaks to splash in the (still chilly) Mediterranean waters and walk along the beach. We ate our picnic of bread, cheese, and ripe cherries, and didn’t even need a trip to the bar for further provisions. Our friend came to say goodbye to us, and we left not long after him, wandering our way back to the Metro for a tired, contended ride back into Rome. I spend an awful lot of time on airplanes, but my true love, transportation-wise, is the train. 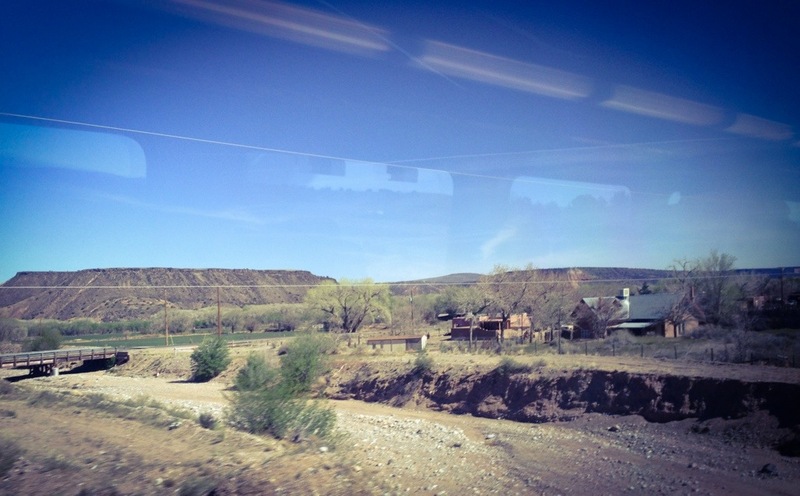 Relaxing in a quiet train car is so much more comfortable and civilized than being buckled into a tiny seat at 35,000 feet, the views from the train are wonderful and you have time to take them in, and then there’s that old-fashioned romance of riding the rails. 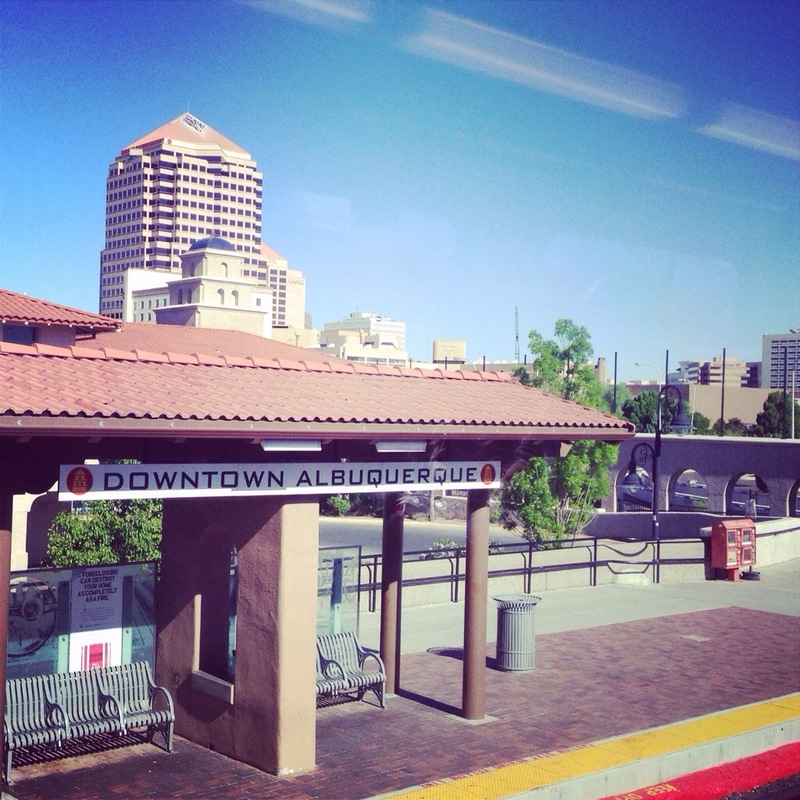 I was pretty excited, then, when my flight arrival in New Mexico last month turned out to be early enough for me to take the commuter train, the Rail Runner, from Albuquerque to Santa Fe. 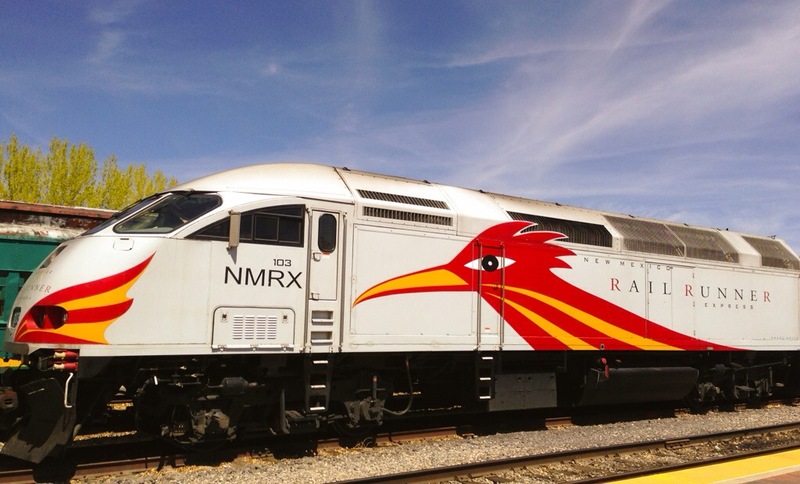 I’ve wanted to take that ride since the Rail Runner began service in 2008, but the timing never worked out and I usually have to take the Sandia Shuttle whose vans and drivers are perfectly nice but you know, it’s not the train. 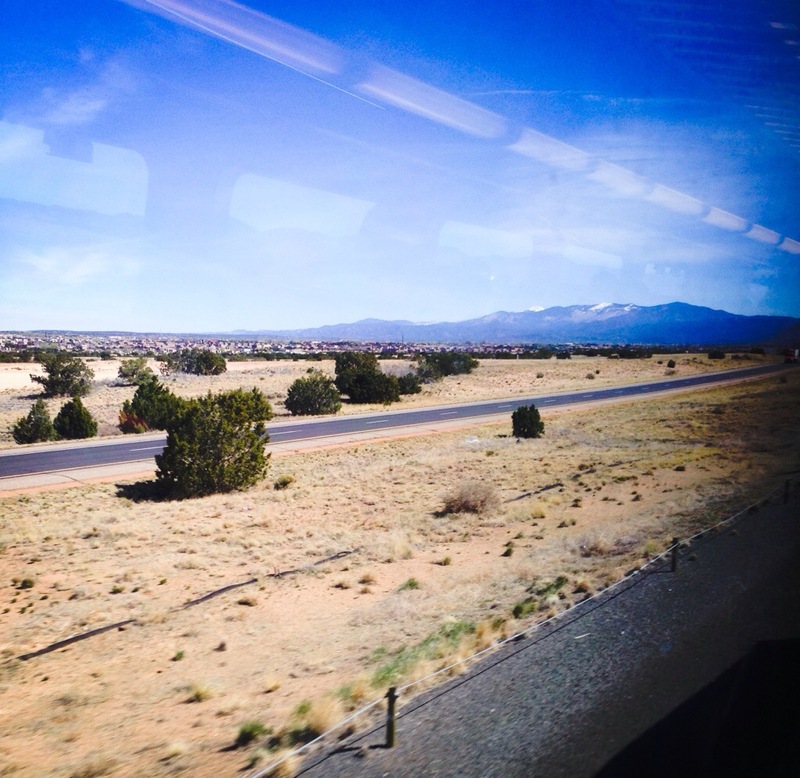 and finally into sight of Santa Fe and the stunning blue of its Sangre de Cristo mountains. It was Spring Break week for Albuquerque students, so a lot of families were riding up to Santa Fe for lunch or shopping. Despite the happy chaos, the ride was relaxing and thoroughly enjoyable. Sometimes the Rail Runner’s tracks closely parallel I-25 and you can see the cars and drivers streaming up the highway to Santa Fe, but for a lot of the ride the tracks are hidden from view of the road and it can feel like you and the people you’re riding with are the only souls for miles around, the lone beings enjoying the quiet blues and yellows of the scenery in all directions. In Bernalillo I got some seat mates, a woman and her two adorable young granddaughters who were on their way to Tomasita’s for lunch. It was fun to visit with them, and I told the woman about my concert with Santa Fe Pro Musica and what I was doing in New Mexico that week. She said she’d try to come. People say that all the time. But, lo and behold, she appeared at my final concert with her parents as her guests, and I was surprisingly delighted to see her there. 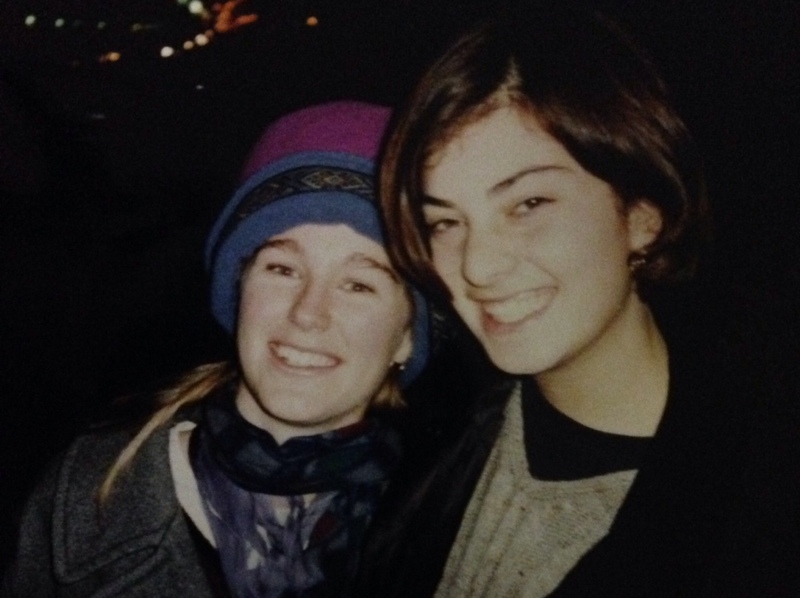 It’s like sharing that train journey forged some kind of relationship between us,something more real than what happens when you chat with a stranger on a plane or in a checkout line. It was the perfect way to kick off a wonderful, sunny week of great music in Santa Fe. 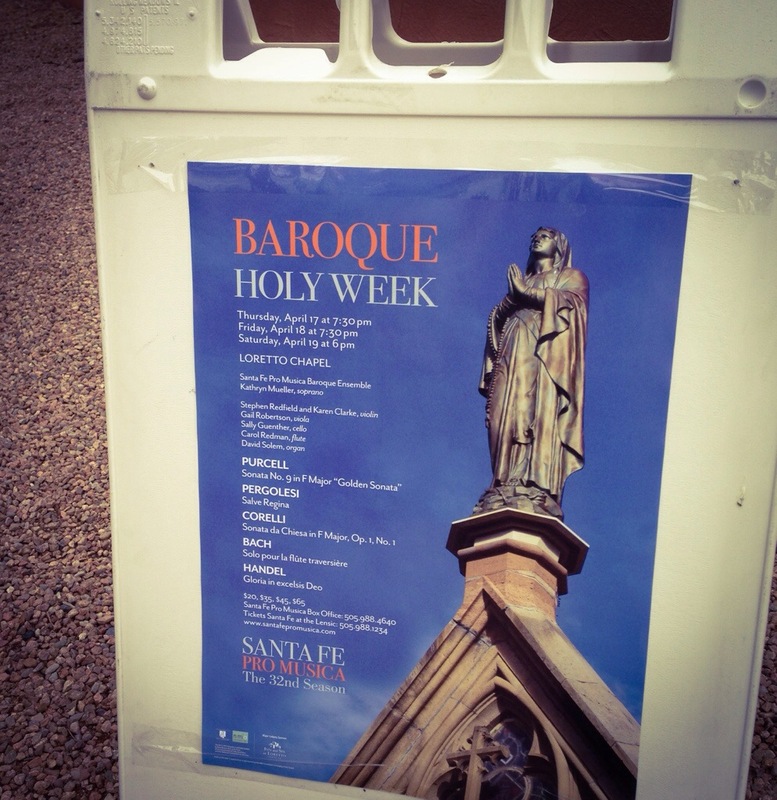 I am in Santa Fe — probably my favorite place on earth — this week for Baroque Holy Week concerts with Santa Fe Pro Musica. 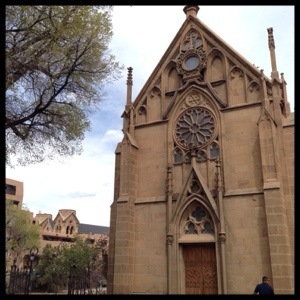 They’re in the magical Loretto Chapel, and I’m singing two great pieces: Pergolesi’s Salve Regina in C minor and Handel’s Gloria. In case you haven’t figured out by now, I like to experience places not just by their sights and sounds, but just as importantly by their tastes. And I have some favorite tastes from this favorite place of mine. Last summer I rhapsodized over Ecco Gelato, which scoops up arguably the best gelato in the U.S. Today I’m here to talk to you about green chile. In New Mexico, chile — both the green made from fresh chiles and the red made from dried chiles — is a culinary staple. New Mexican cuisine features red or green chile sauce, or both (which is called Christmas), on almost every dish. And any self-respecting non-New Mexican restaurant will let you add green chile to your eggs or your burger or your pizza or your pasta. 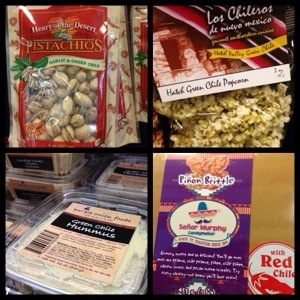 New Mexicans put chile in everything, from nuts, to popcorn, to hummus, to candy. When I was in Indonesia five years ago with the Swara Sonora Trio, several people we met told us that spicy chile (also an important ingredient in Southeast Asian cuisine) was good for singing voices. I decided to take that questionable fact and run with it. I ate a lot of spicy sambal that month. 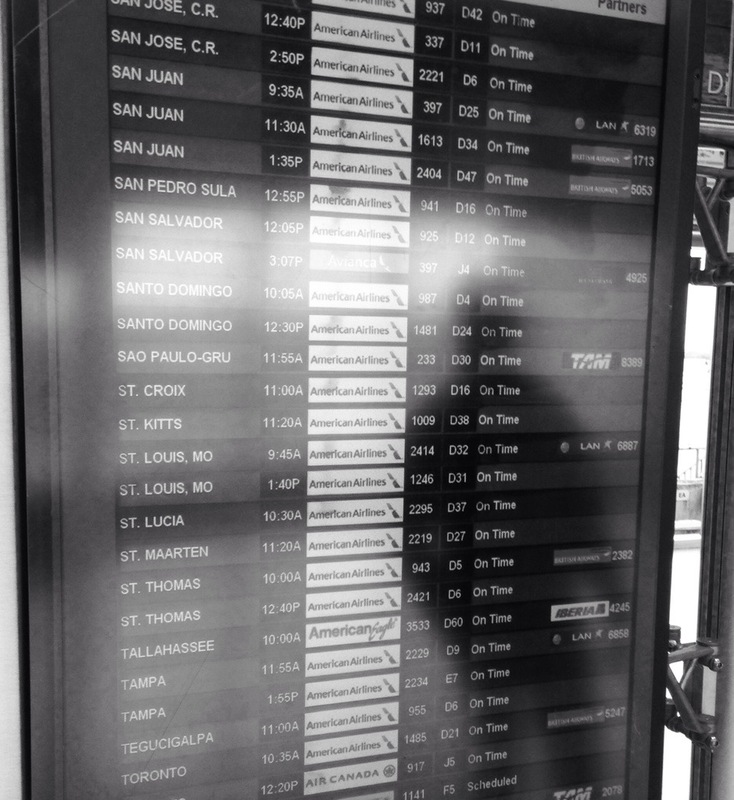 This week I am off and running again, moments after arriving in Santa Fe Tuesday morning. I checked into my hotel and then hopped down the street to the Guadalupe Cafe for a lunch of cheese enchiladas with Christmas. I used to think Guadalupe Cafe had the best green chile in town, but they’ve moved and the menu is different and it just didn’t taste the same. The red chile was pretty good but the green had little taste. Still, it was a tasty meal. Unfortunately, like many singers I have problems with GERD (acid reflux), so I have to be judicious about my consumption of GERD-activating foods. 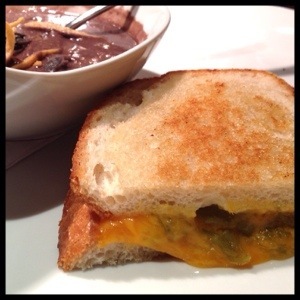 I waited a couple days until my next green chile experience: a green chile grilled cheese sandwich at Luminaria, which paired nicely with their slightly spicy black bean soup. I was wondering whether I could squeeze in two more chile meals before leaving tomorrow, but yesterday I overdid it. 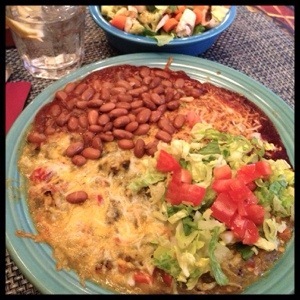 I went to one of Santa Fe’s most famous restaurants, Tomasita’s, and ordered their vegetarian combination plate. 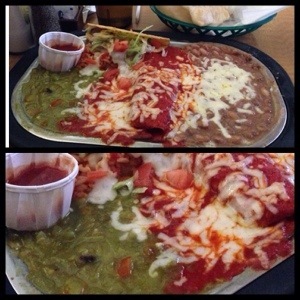 I admit with shame that I scarfed down the enchilada, taco, most of the beans, rice and chile sauces, and then followed it with a sopapilla (which was really not a good choice — fried dough after all that cheese and chile? but it was soooooo good torn into bits with honey poured into the pockets). The red chile was very good, but I should stop kidding myself and ordering Christmas all the time, because I’m a green chile girl. Tomasita’s green was wonderful, and I’m sure I wouldn’t hurt red chile’s feelings by leaving it off my plate next time. Chile may be good for the singing voice, but acid reflux is not. I spent the rest of the day getting mine under control with ginger tea, carrots, and a carefully timed lavender gelato. Luckily I still sang well last night, and finished the Handel Gloria at quite a clip! This week I’m heading to Chicago for two awesome concerts with Wayward Sisters. Lucky for me, I’ve missed the Polar Vortex, but it’s still going to be Chicago cold there, with wind chills in the single digits. And that means it’s time to break out my puffy down parka. I’ve had this coat since the summer I graduated from high school. 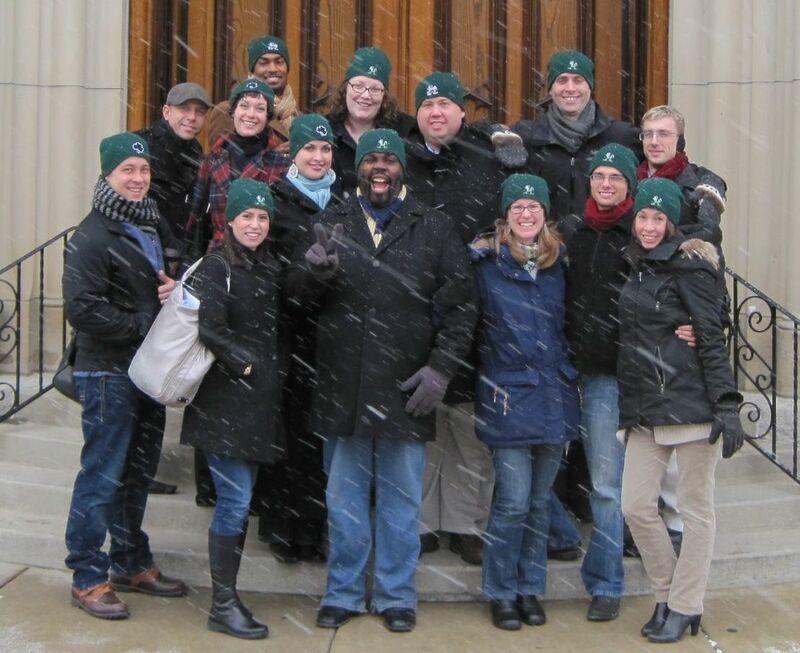 I grew up in cold places — the mountains of eastern Arizona and apple country in northern Rhode Island — but when I chose to start college at Northwestern University just outside Chicago I knew I’d have to prepare for a different kind of cold. I headed to EMS at the Emerald Square Mall in North Attleboro. My friend Anthony happened to be working there that day, and he helped me choose the warmest possible coat to protect me from the single digits and brutal winds of Chicago’s winter. It worked. 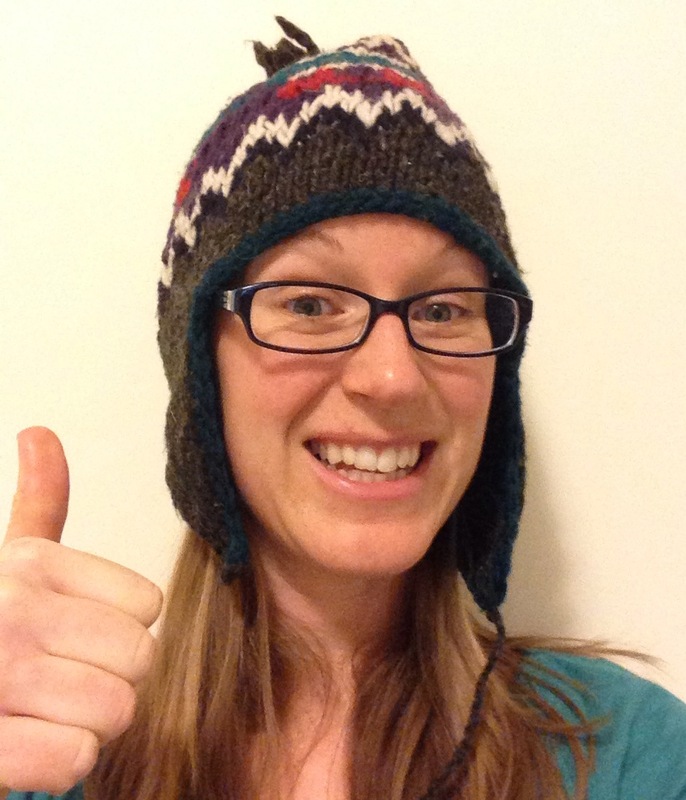 Back then I wore it with a huge fleece hat and full-size earmuffs underneath said hat. 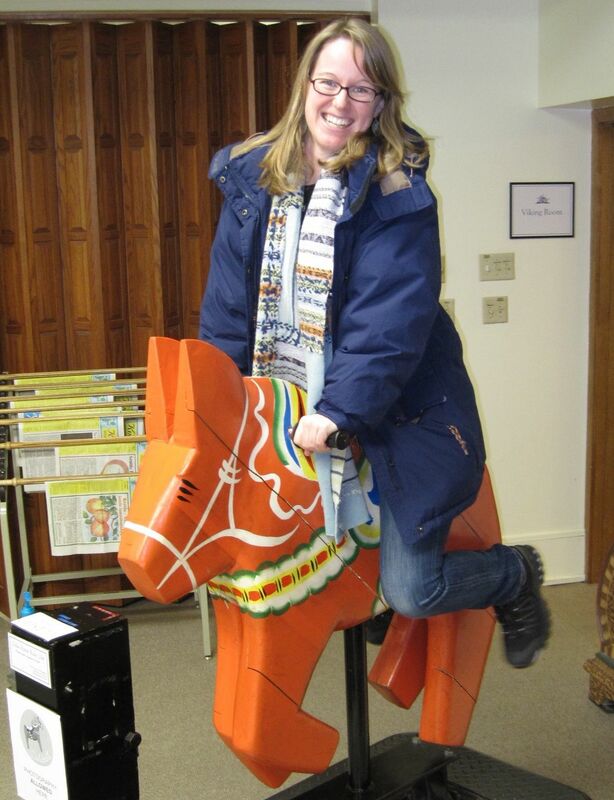 I survived an especially long, cold winter in Evanston thanks to my parka. Now they make parkas that are just as warm but more stylish and less, well, puffy. 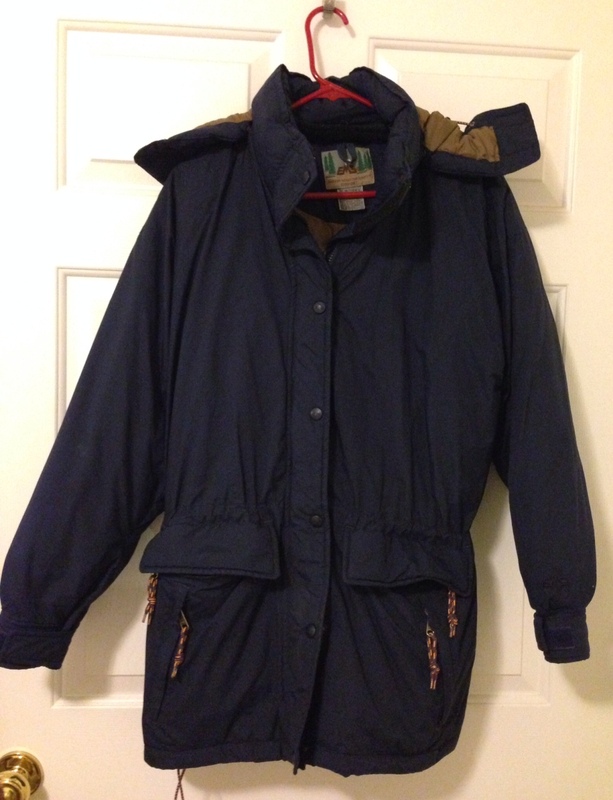 I suppose I could replace my trusty blue parka but it works great, has lots of pockets of just the right sizes and locations, and there’s nothing wrong with it. Well, except for the fact that the zipper pull snapped off in the wash a couple years ago, and it now requires some complicated and dexterous maneuvering to get it zipped. But I’m loyal to my puffy down parka, and it’s taken me lots of places. Just in the past few years it has kept me toasty in Kalamazoo, Green Bay, Chicago, Minneapolis, South Bend, Milwaukee, and Moline. The coldest thermometer reading my coat and I have ever experienced was -15 one night in Green Bay. I’m not a person who needs four seasons. I’d be perfectly happy living somewhere where I could wear skirts and sandals 365 days a year. I hate the cold, but I know how to bundle up against it. And this week, bundle up I will. Lately I’ve had the luxury of gigs at home in the Triangle, and it’s been almost eight weeks since I’ve been on an airplane. But today it’s back up in the air. 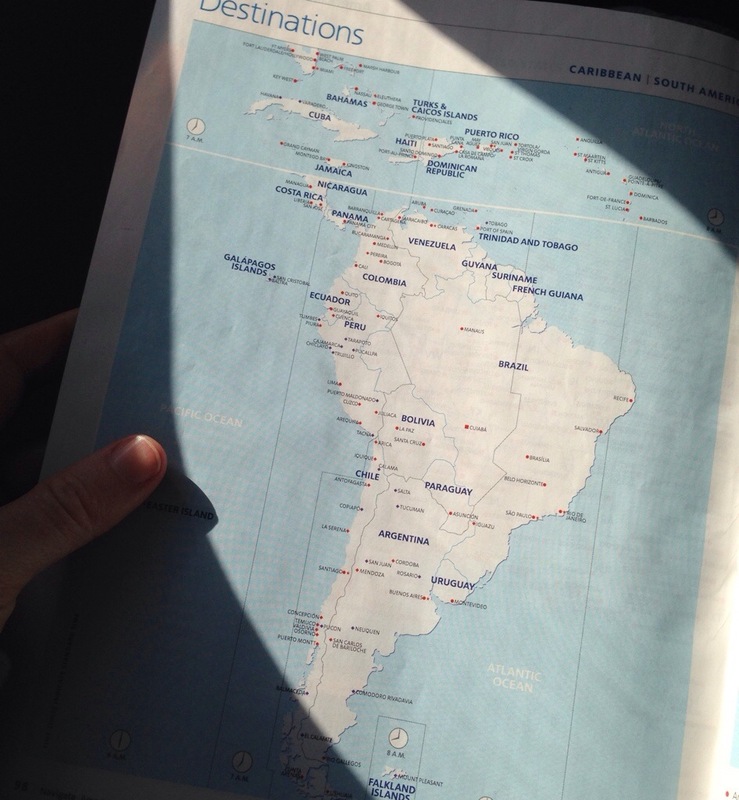 Judging by my trips listing on aa.com, it looks like I’m back to my old tricks, or uh, travels. 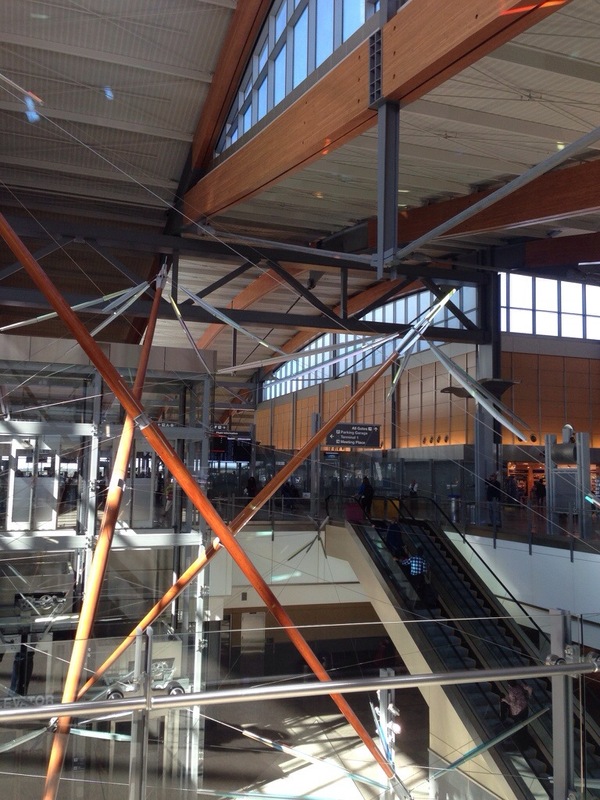 RDU is a beautiful airport, and its spacious, aviation-inspired lobby welcomed me back this afternoon. It’s back to back gigs in Michigan and Arizona for me, and I have one of those complicated multi-city itineraries that I delight in planning. I’m a great flyer. 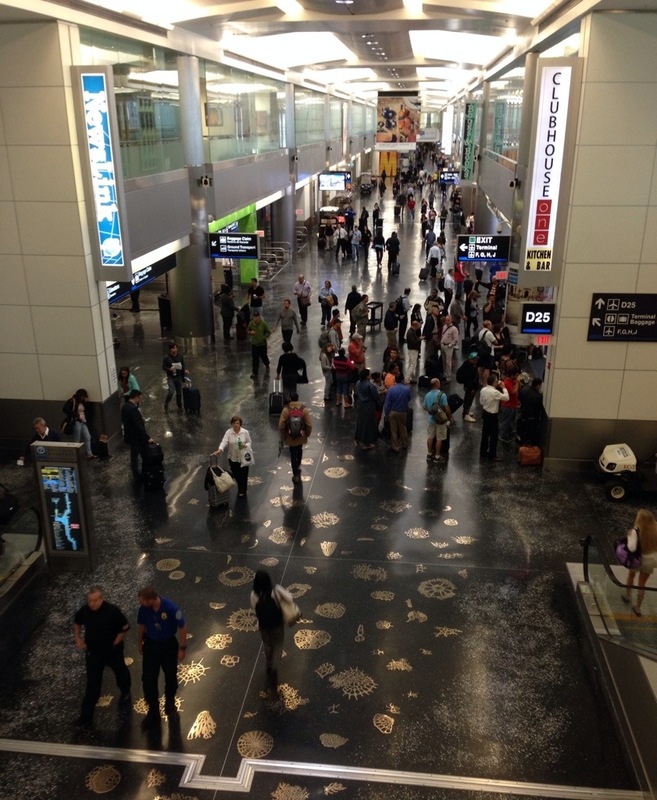 I have perfected all the routines and neurotic habits of a frequent traveler. But even for the best of us, even for those lucky enough to have elite status on an airline or two, air travel is exhausting and frequently unpleasant. 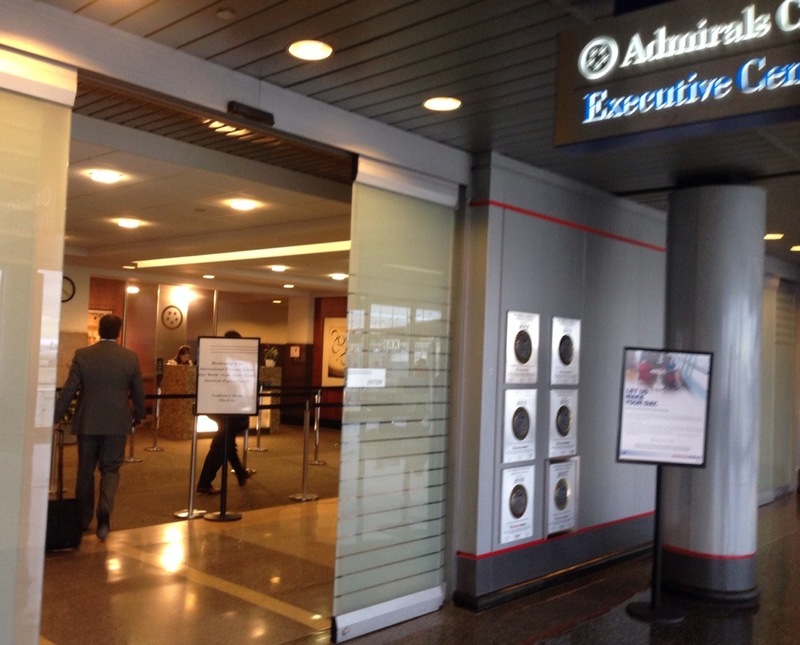 Yesterday American had a flash sale on one-day passes for the Admirals Club, and on a whim I bought one. I decided to use it today because after all, one doesn’t have to jump feet first into the travails of travel, does one? 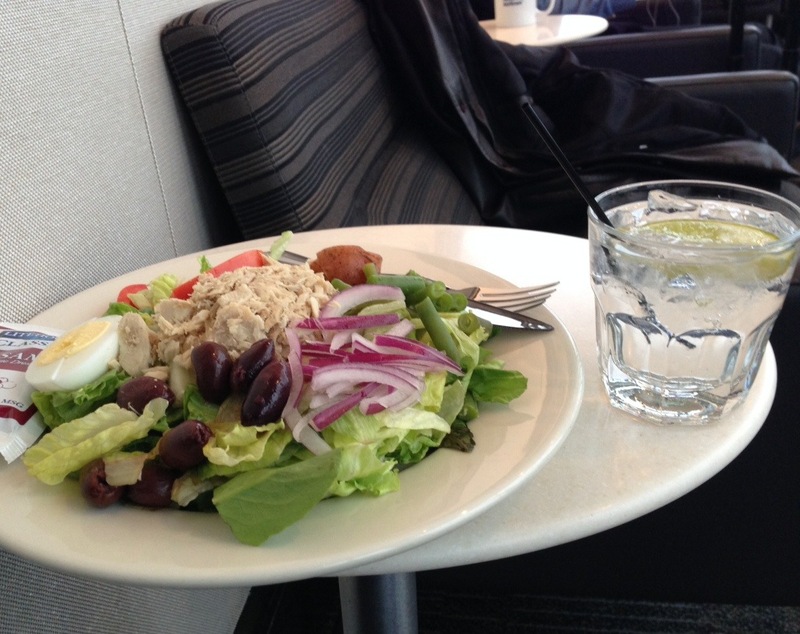 Where I whiled away a refreshing two hours and enjoyed a Niçoise salad served on a real plate. 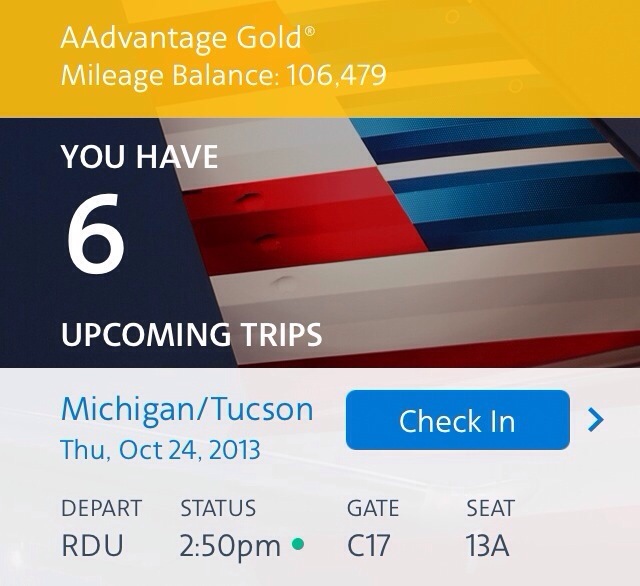 But now it’s on to Grand Rapids and then Tucson, and some great music at both destinations.